If you’ve read or watched any pre-Ryder Cup prognostication, you know that one of the variables cited is home-course advantage for the European side. Part of this, of course, is the boisterous support of the home crowd; the other is that the European Tour schedule includes an annual event at Albatros, Le Golf National’s marquee layout, meaning that many of the Euros are already familiar with its challenges. There’s only one way to quiet the raucous fans — drain a lot of clutch putts and drub them into submission. 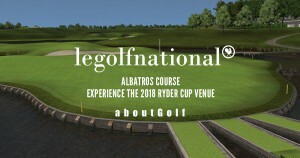 As for the experience of playing Albatros, though, it’s now available in digital form, thanks to aboutGolf’s addition of it to their PGA Tour simulator collection. As a practical matter, this reporter is inclined to downplay the familiarity factor’s potential influence in the actual Ryder Cup 2018 outcome. After all, the Americans, like their Euro counterparts, are quick studies, will have time to practice, and employ caddies who expertly map courses in minute detail. Still, it’s impossible to watch the world’s best golfers, playing the world’s best courses, without developing an itch to check it out for oneself. And even — or perhaps especially — for the technology fossils among us, aboutGolf simulators are wonders of precision when it comes to a digitized version of playing golf.